Are you planning your kitchen and do not know how to organize the space? 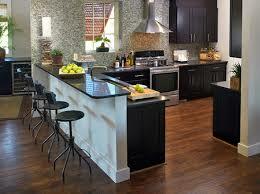 Are you considering a kitchen bar counter and barstools? It is ideal for quick, casual meals and easy to keep clean. High barstools with long slender legs, a bar counter with a worktop behind, which is usually equipped with a hob – it is more and more common to see a bar counter and barstools in the kitchens, and they are mostly used for quick breakfasts. The bar is also ideal for seating of guests, who can make us company, while we are finishing the food preparation. And while sipping an aperitif, the guests can watch from the high stool, what kind of speciality we are preparing for them. The kitchen counter is usually connected with the worktop, so they both should have the same height of about 85-90 cm (35 in). If you want to make it higher, the difference between the bar counter and the worktop should surpass 10 cm (4 in), so that serving was easy and comfortable. The barstools must have footing and the seats should be about 20 cm (8 in) lower than the bar counter. The barstools must be comfortable because sitting on them is more strenuous than sitting on conventional chairs. A Fashionable Addition Or A Practical Use? The bar counters and barstools must match the dimensions and functions of kitchen bars: the counters are narrower than a usual table and the stools, although used for sitting, should not interfere with the everyday traffic. That is the reason for the high legs: whether you want to sit down at the bar or to leave it, you do not have to push the stool, but only slide down from it. When considering the bar counter in your kitchen, you should make sure, whether it is the only place to dine or whether it is merely one of several seating options. 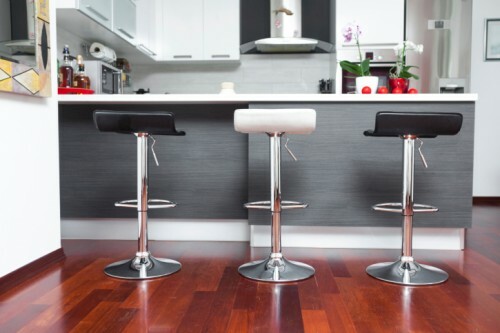 The dining counters with stools are mostly chosen into the kitchens of single people or families with bigger children. It is also often the only option in very small kitchens, wherein a classic dining table would not fit and a folding table is not suitable. In general, a kitchen chair and stools should be lightweight, strong and stable. The spread of bar seating in residential interiors requires more interesting design of the stools specifically, as well as a wider variety of colours and materials. A tripod may be practical in this case, too, although it may not seem so at first sight. The barstool frame is usually made of aluminium or steel profiles or tubing and the seats are made of various kinds of mould plastic; they may be wooden or upholstered and they are mostly fitted with low backrests. The seats made of stained bent plywood, the chairs made of rattan or exotic woods are interesting, too. The extravagant up-to date hit are stools made of acrylic glass which brighten the interior and despite their visual subtlety, they are strong and durable enough. A chair with an interesting shape or material can become the dominant feature of the interior. But when choosing it, keep in mind, that the chair is primarily used for sitting, so the comfort is first. When you want to buy one, try to sit on it for a while. The freezer is a great help to us but not all foods can stand refreezing. Keep it in mind and protect your health. The shelf life and freshness of foods increases with freezing significantly. We are going to explain, what actually happens during freezing and thawing process and the reason you should not refreeze certain kinds of food. Although frozen food retailers often do not admit, the quality of fresh foods cannot be substituted completely by anything else. Freezing always partially disrupts the structure of mass and the taste of the food changes. In case we do not want do the shopping again and again, or we need to feed the whole family, we can apparently tolerate some taste loss. Put It Back Into The Freezer Or Eat It? The disadvantage mentioned above grows with each refreezing. Once you take the food out, let thaw partially and then put it back into freezer, its taste gets a little poorer, when you use it next time. But it is not all. The bacteria that start to grow in foods after thawing are much more dangerous. That is why restaurants and other kitchens and canteens must follow the hygienic rules for food freezing; but we should follow them for the benefit of our health, too. So which foods can be refrozen and which should not? The practical rule No 1 says, anything containing fresh proteins should be put to freezer only once, than thawed and consumed completely. This is primarily the case of meat. If possible, let the meat to thaw slowly in the fridge at the temperature of about 5 °C. 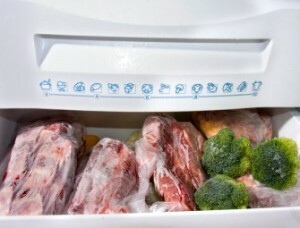 It should be sufficient to prevent bacteria from forming, and you can return the uneaten meat back to the freezer. But never refreeze raw meat that thawed at room temperature! The rule can be bypassed in only one way, and that is the heat processing. When you prepare a meal from the thawed meat, you can put it back to the freezer, but you obviously cannot repeat the process more times. Certain foods get frozen to the supermarket, but later when in display, they get partially or completely thawed. Therefore you should inquire the way the retailer handles the food and either freeze it or eat it. After once being melted, none of these foods should be refrozen. 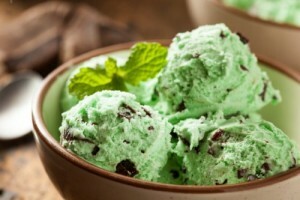 So when you want take some ice cream from a tub, do not hesitate and take as many servings as you need and put it back. If the ice cream is too melted, let it thaw completely and use it e.g. for a milkshake. The same holds for fruit juice or fruit pulp. They are not a matter of a serious health risk like meat, but both water and cream ice products lose their pleasant taste significantly after being thawed and refrozen. Tip: When buying an ice cream stick, ice cream cone etc. in a store, feel it with a gentle palpation to know, whether it has a non-standard shape. If it does, it means that it melted partially and then refroze, so it will not taste so good. Fruits and vegetables contain much water that is why their structure deteriorates easily when refrozen. If possible, freeze them lying side by side e.g. on a smaller baking sheet wrapped in a plastic bag, and then pour them together – you will prevent it from becoming one big piece of ice. When taking a few pieces from the package, be quick and close the packaging thoroughly. Tip: Do you like smoothies or other fruit milkshakes made in a blender? 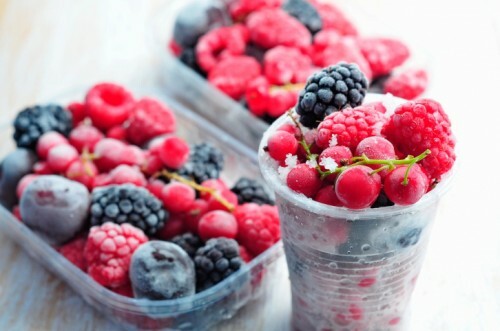 You can use the frozen fruit instead of ice cubes. It will cool you beverage as well and the blender will be less strained than with pure ice, which can damage the blade. Even the simplest things often help us in our everyday lives. Have you ever, for example, tried to live without a cutting board? We will advise you now how to take proper care of the underrated utensil. It matters, what we use to cut your vegetables, meat and other food on before cooking it. 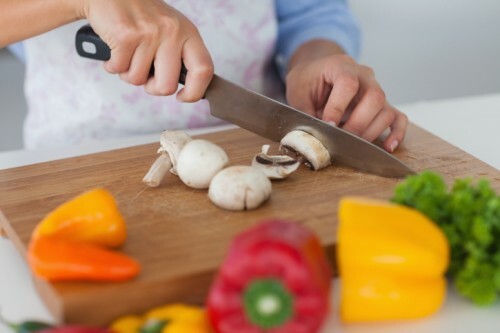 The plastic cutting board does its job and does not do any harm, of course, but using a genuine wooden cutting board makes a big difference. But how about the deposited bacteria? 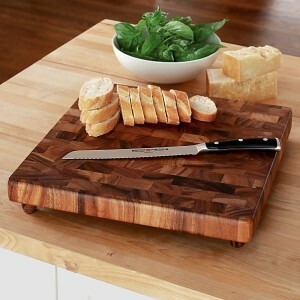 To begin with, we have to explain a myth: a wooden cutting board does not host bacteria any better than a plastic one. The tests of cutting boards of different materials proved that their surfaces are mostly the same, as to the conditions for bacteria, and the difference mainly lies in the thoroughness of removing all the food residues. So it is unlikely that the wooden board is soaked with the juice from raw meat that will cause poisoning to you later. It is not good to soak the wooden cutting board in water or to use detergents on it. Soaking in water can cause swelling and subsequent disintegration of the wood, while detergents are often too aggressive and can add a strange smell or taste to your food. Any wet cleaning should therefore be done sensibly without large amounts of water. After mechanically getting rid of all removable food remains, it is good to rinse the board with the mixture of water and a spoonful of white vinegar. It is a natural disinfection, which cleans the surface of any unwanted bacteria. Before the board dries completely, you can lay it down with its work surface up and sprinkle it with coarse salt. It pulls not only the remaining moisture, but also any undesirable odours out of the wood, which have remained from cutting and slicing of raw materials. The salt will have a similar affect on an older dry cutting board, especially if you put both boards together in a plastic bag. If you want to be even more thorough, you can take a lemon half and rub the board with it, while the salt still on. Leave the mixture of salt and lemon to work for 10 minutes or so and then rinse it. You should impregnate the board as frequently as you use it, which means from once in a month to once in three months. 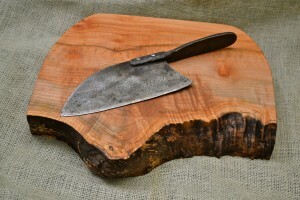 A mineral oil is used for the treatment of the wooden cutting boards. A suitable alternative is, e.g. the almond oil or other oils which do not go rancid easily (so you would better avoid the olive oil, even though you like it). Pour a small amount of oil on the board and rub it gently using a dish cloth. Do not forget the edges. Let the oil soak for a while; do not remove any surplus oil, but rub it into the wood with another clean dish cloth. During their lives, more and more people move and begin to live in a new place. Whether you move for work, for study or for love, it always takes some time to settle in a new home. It is never easy to leave your background and to settle in a new town or city. You hardly know anyone, you are disoriented, you miss your favourite pub or grocery and you cannot distinguish a neighbour from the caretaker in the hallway. But do not despair, you can deal with every change! Be prepared for the fact, that your acclimatization in a new city will take more than a month. You will have to be very patient and must not give up, whenever a crisis appears. Especially if you move alone, the feeling of loneliness may be nearly unbearable sometimes – but you can do something with it! A crisis is certain to appear during the first year, when would you despair, why you, on earth decided to move?! Be sure, it is not your providence, but only your fear and frustration, who talk to you. If you follow these steps, you will get accustomed to a new home more quickly and conveniently. In the early days, a contact with your loved ones will be crucial. Fortunately, there are many ways to communicate remotely and in real time today – you can phone, use Skype, Email or text to them. As to social networks, be careful: following your old friends e.g. on Facebook can intensify your regret and sorrow, as you cannot go out to have a drink with them, or so. Try to find a regular rhythm and to communicate with your friends and your family e.g. in two determined days of the week. The frequency depends on you, of course. When you plan the rough schedule, you will not only have something to look forward to, but also you will avoid chatting with people in a different city all the time, instead of making new friendships. You may not have money to waste, but it does not mean you have to live in conditions that will cause a clinical depression to you. Ease the transition by choosing your new dwelling so that it was comfortable for you. It means not being alone and finding a roommate for someone, buying a pet for the other, and investing at least temporarily in better housing (and being more modest elsewhere) for the next one. In any case it is not time to get more sources of stress now. Be kind to yourself. Have you planned to start a sport for years? Or have you considered signing up for cooking lessons? Would like to learn to dance, finally? Whatever it is, moving to a new place is a great opportunity to start it now; it is always something like starting a new life, anyway. The more sociable activity is, the better, of course. Do not rely on finding new friends at work or at school. You may not succeed, and in some cases, it is not ideal to meet the colleagues in your leisure time, because you would continue to be in the “work mode” in a way. It is likely that you, or your family, already have someone you or they know in the new city. Try to meet him or her even in the case you have never seen them in person before. You already have something in common now, which is definitely a promising start – and you will have something to talk about. When making new friends, be open and welcoming. Respond to your neighbours, if they say “hallo” to you and if they look friendly, do not be afraid to start small talk. Introduce yourself to any new people you come in contact with, tell them you are new here, and have their favourite places recommended. How To Choose A Kitchen Thrash Can? 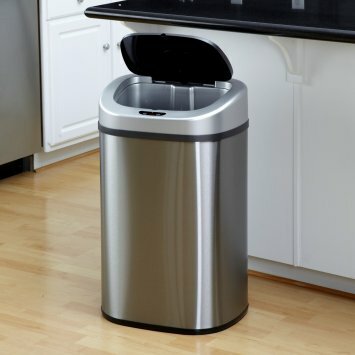 A trash can is often the last thing we think about when furnishing the kitchen. But it is wrong, because we use it every day and if it is practical, it will be very helpful to us. The thrash container must be in every home. It fits neither to the living room, nor to the bedroom. It is usually in the home office and the children´s room, too. And it must not be absent in the kitchen. In general, it can be either built-in or a freestanding one. It consists of one or more containers. In most kitchens, a plastic or a stainless steel container is typically used for discarding the waste. Whether it stands in the corner, by the sink or next to the wall, it occupies too much space, not mentioning the overall aesthetic impact, which often is not good. In case you are furnishing your new kitchen, you should consider all the pros and cons of both the freestanding and the built-in trash cans. As to new kitchens, designers nearly ever try to find a place for the can in advance, and the place is usually inside a cabinet. Of course it depends on the size of the kitchen, wherein the thrash can would be placed, so that it did not occupy too much space at the expense of the storage for dishes and kitchen utensils. Therefore it is advisable to place the can in a sink cabinet, which is the already “impaired” by the water seal or the hose from the water tap. However, it mostly does not fit next to the garbage disposal. The trash container should be placed as close to the sink as possible, because the sink is the place where food is cleaned before further cutting and dividing. During the process, many cuttings are produced and they should be discarded immediately and easily. The built-it can has many advantages. For example, when you open the cabinet, you open the can as well, so you have a free hand to sweep the cuttings away. The built-in thrash cans always have a top cover inside the cabinet, so you need not worry about the smells. There are some specialties, too. One of them is the ability to open the built-in can by pressing a pedal under the cabinet door – both your hands are free then. And the second speciality works only, if you have a non-laminate worktop; it means the use of special cans fitted directly into the worktop. You just pick up a small cover and sweep everything unnecessary from the worktop directly into the waste container. A typical thrash can in our homes has with a lid and a plastic bag flatters from it, so it is no decoration for the kitchen. If there is no more space left for a built-in can in your kitchen, or your kitchen is an older one, where the rebuilt would be complicated, try to buy an interesting and distinctive thrash can. The manufacturers offer stainless, chrome and plastic waste containers in all imaginable designs. If you have a rustic kitchen, the container can be concealed e.g. by means of a suitable fabric screen. It is only a few steps of space between a wall and the opposite one, you can hardly turn yourself in the hall, the cloakroom is unrealistic – even though living in a small apartment can be good. There is nothing to teach you saving better than a small living space. 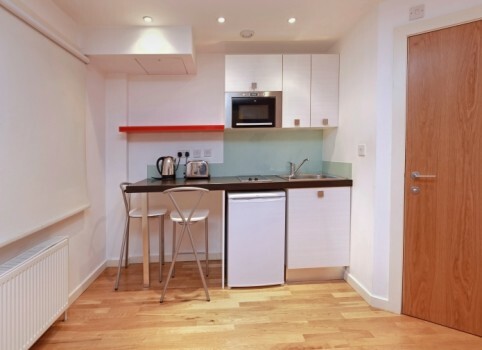 You cannot pack in a luxury leather sofa in any way and a huge coffee machine would not suit into the little kitchen. Take it as a practical lesson in planning. In a small apartment, do not try to align all the smaller items and to put it back in place each time – you will never succeed entirely. Take all the storage components into account instead: boxes, bags, hangers, small chests of drawers on castors etc.. Better yet, if you can fold them when not using them, so that they do not take up too much space. It is always better to have a designated place for the small items. In a small apartment, you cannot afford to waste space or design the space too generously. You should not expect you will go through a narrow path around a dining table for six people every day; you should better get, for example, a folding table that works as a shelf when folded. The hidden storage spaces in furniture, cabinets with slide-out work surfaces etc. are helpful, too. Of course it is not ideal to build furniture on all walls of the apartment, but definitely you should use the vertical space for storage. In furniture stores, look for kits including stackable and extension parts to create a high cabinet system. Of course, you must pay great attention to the stability of the structures to avoid you cabinet from tipping. If you have sufficient resources, the built-in cabinets are ideal. Vertical storage has a huge effect in a small apartment and clears a lot of space. If you lack storage space, stick to the rule, that there must not to be any blank zone in the apartment, which is not necessary because of aesthetics or comfort. Lots of free space under the bed? Unacceptable. The upper surfaces of cabinets storing only dust? Impractical. Whenever buying a new object, a piece of furniture, decoration or kitchen appliance, look around and sort out an older one. There is always something you have not used for a long time or something that no longer works as intended. The same rule applies for clothes and shoes so that your wardrobe will not grow too large and occupy the precious place. This advice is not very amusing, but it´s necessary. In a small apartment, even a dirty plate on the table looks like a big mess. When you have bigger home, you can afford your home to be a little untidy in a bohemian way, a small flat should be, however, kept in order. Otherwise, you will not feel there quite well yourself. Do not give out money on things you do not need indeed, on things too big for your household or on cheap, unsightly or poorly durable goods. Your space is precious, that is why it should not be occupied by scrap. 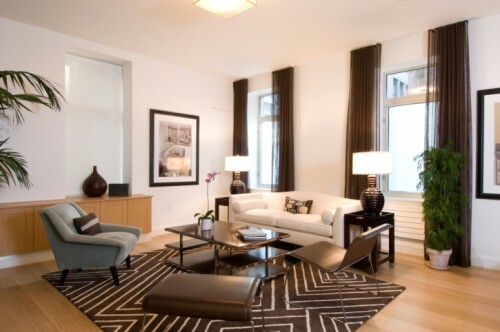 The first impression – this is the main reason we should pay attention to the appearance and furnishings of the hall. This space must meet its practical function and must be representive, as well. 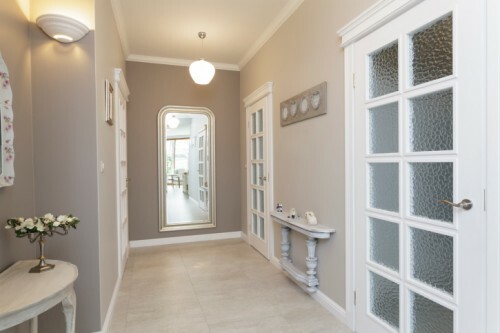 A hallway is a „window“ into an apartment wherein a visitor gets his or her first impression of our dwelling – and of us, too. Whether we like it or not, we often unawarely estimate the remaining part of the apartment according the small entrance area. And our visits judge our entrace in the same way. A hallway should not be only superficially pretty and representative. In a way, it should also reflect the atmosphere of the whole apartment, so its arrangement and disposition should correspond with this function. It is not so simple, anyway, as a hall is still often seen as a marginal room, which is small, narrow and windowless. However, merely a beautiful interior is a luxury in this pragmatic times, so we have to take into account the practicality and effectiveness, as well (although we must not ignore the aesthetic aspect, of course). First of all, me need to assess the ergonomics of the space, which is not easy, since we have to combine several other mismatching requirements for the entrance area. A hallway is a partial barrier between exterior and interior and a kind of reception area at the same time. It is only up to us whether we will create a friendly inviting atmosphere here or whether it will contrariwise serve as a rampart protecting our privacy against the sights of outsiders. A hall is also an internal communication space of the apartment enabling us to go from a room to a room. It can also separate the kitchen, the living room, the cloakroom or the utility room from bedrooms and private spaces. This is where you put off your clothing and footwear, which should be stored, hung or put away somewhere. Therefore it is necessary to ensure its passability. We often enter the hall in dirty shoes or dusty clothes, that is why there must be space for putting them of, brushing or cleaning them. It is necessary to divide the so-called clean and dirty zone. To leave the dirt from outside really in the hall, a small area should be separated for storing shoes and wet things so that they can dry out well and have enough air. It is good to separate this part of the floor by using floring in a different colour, whicht should naturely be resistant to abrasion and moisture and have an easy maintainance. A mirror should not be missing here, either small one or (if you have more space) a large one for the whole figure. In the so-called clean zone, there is a storage space for the coats, hats, bags, purses and if possible, even the travel bags and suitcases, seasonal footwear, sports equipment, cleaning agents etc.. The items used only occasionally can be stored in less accessible areas, such as a shelf right below the ceiling. A common problem of hallways is the lack of space. If they cannon be extended by a building adjustment, you can achieve extension at least visually by use of colours. Generally said, the dark colours diminish the space, the dark ceiling seems to be lower – and light colours have the opposite effect. If the hall is narrow, we can optically widen it by transverse stripes on the floor or on the walls, but these stripes lower the room at the same time. The lengthwise stripes on the floor make the room look longer and the lengthwise stripes on the walls make it higher and narrower, at the same time. Large designs on the walls make the space smaller while small patterns are more generous to the space. The effect of the patterns increases with their size and color saturation. Red hues highlight the areas in the horizontal direction, a red floor seems to go to meet the newcommer. A blue floor enlarges the space optically but does not encourage to stay longer. The yellow walls make the room lighter but yellow is not very good for the floor as it gives the feel of instability. The optimal colour is green, which generally calms down and if used on the floor, it raises associations with a green meadow. If the room is too narrow, you can enlarge by means of mirrors on the walls and sliding door cabinets.